Ornithology, in spite of having such a long name, is bound to remain a traditional, oral and emphirical craft. You can’t have a correspondence course in birds. You have to go out to them in person, with a companion to start you by experience and word of mouth, and then you have got to find out for yourself. In fact, birds are handed down apostolically. They are the kind of thing that cannot be industrialised or mechanised or mass-produced or turned into print… They have got to be encountered personally, in parties preferably of not more than two, and their lore has got be handed down in the honest old verbal chain: so that what I know comes down to me along a linked descent of gamekeepers and sons of farmers and birds-nesting little boys, each one inheriting in affectionate personal contact, generation after generation, as the honest trade of sculpture was handed down in Greece. In the 80 years since T.H. White wrote this, the modern world has found ways to automate the tradition of bird watching, but at its heart it still involves observing and interacting with nature. 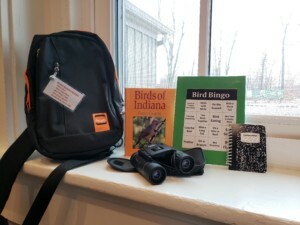 This weekend marks the 21st annual Great Backyard Bird Count created by the Cornell Lab of Ornithology, the Audubon Society, and Bird Studies Canada. Observers all over the world will watch and log their findings and the combined data will give us a bird’s eye view of larger migration patterns to help ornithologists recognize potential threats. Apart from conservation, there are lots of other reasons to take up bird watching – relaxing, enjoying the natural world, the love of learning about birds, or the love of birds in general. You don’t have to be a bird expert to take part in the program – there are lots of resources to help you identify birds (apart from the traditional field guide, there are free apps from Cornell and Audubon for most devices). And you don’t have to do it in your own backyard, as long as you watch for at least 15 minutes, you can log birds anywhere, including the Galena Digital Branch which will be having a bird watching program this weekend. Bird bags will be available for use at the Galena Branch and we’ll also have some other bird-related activities and a bird-themed Family Storytime Saturday at 10:00 AM.